Our school parliament is made up of 24 pupils who were elected to represent the views of all pupils and to work with the leadership team to improve our school. Each year, after an electoral campaign and polling day, every class will elect representatives from their year group; they will be members of the school parliament for the next academic year. to develop leadership in the school. As effective members of parliament we listen to and represent the views of our class, we represent our school and we get things done! 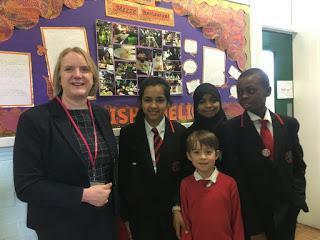 We were delighted to welcome the Deputy Mayor for Education and Childcare, Joanne McCartney to our school.